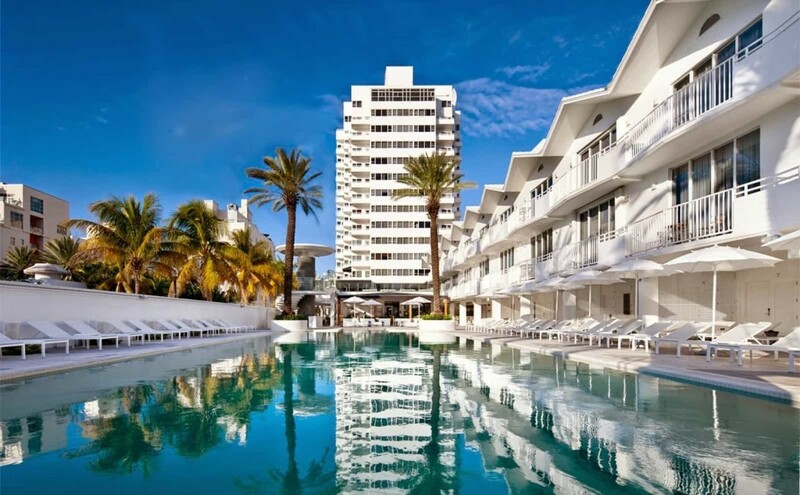 The Shelborne Hotel is an Oceanfront Hotels that is right in the heart of Central South Beach. This Four Star Hotel is rated one of our Best Beach Hotels. 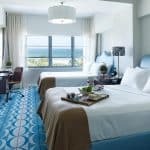 It’s a classic Art Deco Hotel that will give you a true South Beach experience. This 200 room hotel underwent a massive renovation in 2014 updating much of the property, furnishings, and decor. The rooms like many Art Deco era hotels are on the small size and some of the bathrooms are so small they are cruise ship sized, but they are updated. 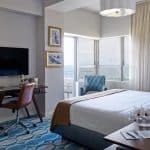 Not all of the rooms have balconies, and some of the Ocean View rooms are really partial Ocean View Rooms. The staff here consistently gets good marks for high-quality service, while it’s not a luxury hotel, it can sometimes feel like one. This hotel has one of the long skinny pools that people think of when they think of South Beach, although it is on the small side and can get crowded at busy times of the year. Like all South Beach Oceanfront hotel, access to Miami Beach is via a paved walkway at the rear of the property. 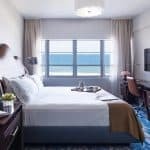 This hotel’s exceptionally good service, beach access, great pool, central location, and reasonable prices make this one of our top Value Hotels. This hotel is not friendly and isn’t a great family friendly hotel. 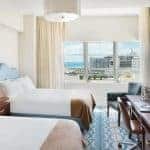 This hotel is best suited for someone who wants a South Beach experience, isn’t going to mind a small hotel room, in exchange for staying at a great location, for a reasonable price. This hotel is most similar to The Nautilus, The Raleigh, or the SLS Hotel. A taxi from Miami International Airport to the Shelborne Hotel should be $60. A taxi from Shelborne Hotel to Central South Beach should be $15.